Most people have unfortunately had a dose of my (Gardner) sense of humor/joke repertoire, which mainly consists of bad word play jokes at awkward moments. It’s always a good night if I can find someone that shares this quirky trait of finding things funny, that objectively, really aren’t. In the end, I’m just a fun guy, and that’s why I like mushrooms. Actually, I’ve loved mushrooms from a very early age. The first pizza I remember eating had mushrooms on it, and since then, I’ve never turned back. Probably from 5 or 6 on, I would be very happy if all you gave me was a fork and an opened can of mushrooms. That’s right – I liked all of them, even the canned variety. The best yet were the morels that we found out at the farm/mountains (top picture on that page), but whether its white button, shiitake, oyster, or portobello (or anything else for that matter) I’m happy when mushrooms are on my plate. 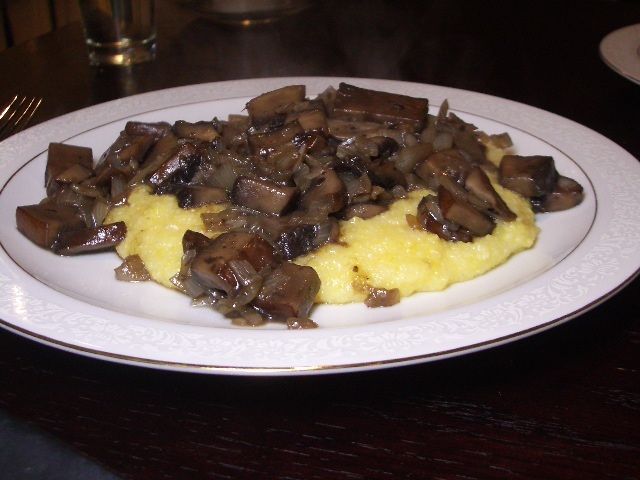 I never tried eating any mushrooms from our Texas ranch (too worried about hallucinations), but I do love mushrooms and I love grits. I will definitely try out this recipe. Thanks. Still have not found this year’s crop of Morels on your land but will keep looking. That would make a tasty dish, wouldn’t it?